Use for Mice, Rats, Ants and Spiders. Just plug it in! Perfect for the Home and Office. 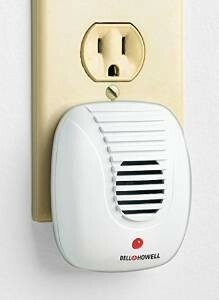 Helps repel household pests by emitting waves of constantly changing ultrasonic signals that pests have a difficult time adapting to. Ultrasonic Repellers are safe to use around your family and any non-rodent pets like cats, dogs, birds and reptiles. Do not use this product around any pets such as hamsters, gerbils, mice and tarantulas. Ultrasonic sound will lose intensity as it travels and is absorbed by soft objects such as carpeting. It is also reflected by hard surfaces, such as furniture and cannot reach nesting and feeding places behind walls, under floors, or within cracks. For larger rooms multiple units may be necessary.